SIGN UP FOR A VENDOR TABLE! Grab a booth for the lobby area or in the main hall. You may sell merchandise or showcase your business. Available booth spots will be assigned on first come first serve basis. The fee covers your booth for both Friday and Saturday events. There may be some overflow spaces available on the balcony. YOUR VENDOR TABLE INCLUDES PROMO PLACEMENT IN THE SWAG BAG! 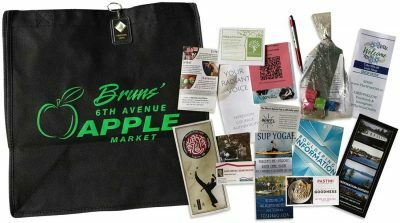 Add any flyer/coupon/promo to the swag bag (provide materials for 125 bags). Swag bags will be distributed on Saturday morning to each signed up teen and adult participant, family member if with younger kids, attendees and volunteers, until we run out. Booths in yellow are available for the 2019 season.